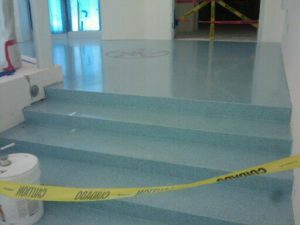 ACI Flooring - Terrazzo Flooring Hollywood California | ACI Flooring Inc.
ACI installs terrazzo in new construction and restoration projects in the city of Hollywood because of the many benefits it offers. Among these are strength, durability, long life span, affordability, it is environmentally friendly and recyclable. The process utilizes an innovative aggregate placement with epoxy and cement, finished with a grinding and polishing system that brings out the natural beauty in this finish that is called terrazzo. Terrazzo finishes produce a highly reflective surface that is not only aesthetically pleasing, but reduces the amount of lighting necessary which cuts electrical and maintenance costs and increases durability. All of these steps seal the floor and polish it to a matte, satin, or glossy finish. ACI uses environmentally safe methods. 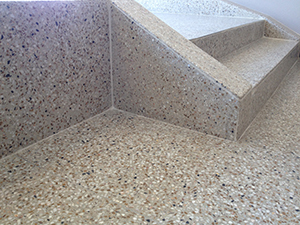 We offer two options for terrazzo flooring: epoxy and cement in the city of Hollywood. The difference between the two is the mix matrix. The price difference is material and installation. Both materials use the same aggregate sizes (marble, glass, shells, etc.). The cost fluctuates depending on the aggregate used. The least expensive per pound is lighter earth tone marble chips. The most expensive per pound is cobalt blue and abalone. The price for both systems includes the use of divider strips. Divider strips are a very important factor for both systems that allows for long-term floor stability during contraction and expansion, the same as control joints for concrete. If you live in Hollywood and would like us to give you a quick estimate over the phone, please call 1-888-287-0524. ACI has spent years developing the techniques to install a unique polished terrazzo flooring system that is cutting edge, beautiful, low maintenance and one-of-a-kind. 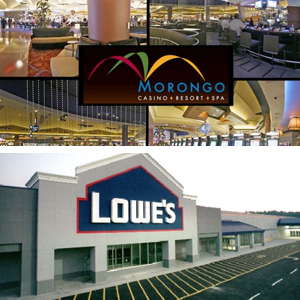 Broadcasting aggregate into cement can create some unique and elegant finishes, it can be infused with different color combinations of unique aggregate, designer glass fragments, and even glow-in-the-dark engineered stone. Every surface is unique to your design and color combinations. 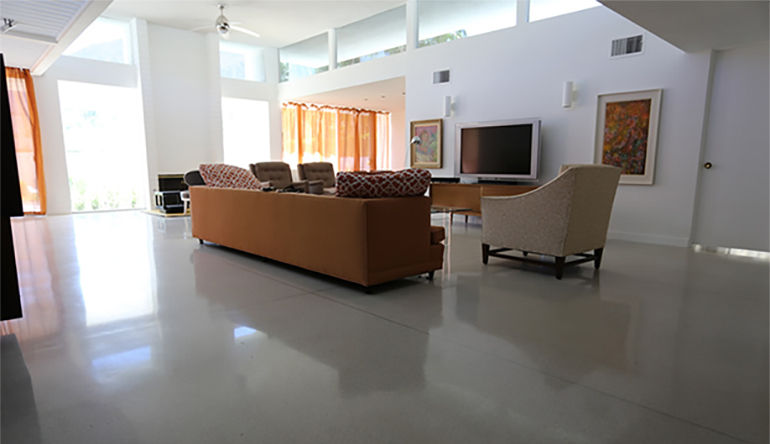 Polished cement terrazzo is a great alternative to some terrazzo systems. Create a flooring solution that fits your project.